Android has gained smartphone share in nearly all major markets, according to the latest data from Kantar Worldpanel, benefitting from Apple’s slowdown and the terminal decline of Windows Phone. In the EU 5 (UK, France, Germany, Italy, Spain), US and Australia Android gained over seven percentage points of market share in the first quarter of 2016, compared to the same quarter a year ago, while in China the gain was six points, with only Japan bucking the trend. In both the US and China most of that gain was from Apple, which lost five points, but in Europe it was Windows that halved its share from 10% to 5%. “For those switching from Windows, Android has offered a better user experience, with a variety of brands and models across a multitude of price points,” said Dominic Sunnebo of Kantar. “In Italy and France, the strongest Windows Phone markets for a time, nearly 10% of Windows mobile users moved to Android in the three months ending March 2016. In the US the Samsung Galaxy S7/Edge is already a hit, despite only being on sale for a fraction of the quarter, grabbing 6% of all national smartphone sales. Kantar had a think about what Samsung did right this time, as opposed to the S6, and concluded it was as simple as sorting the specs out, such as a better battery, improved camera and the reintroduction of a micro SD slot. Apart from that Samsung seems to have raised the bar even further on marketing and channel spend. 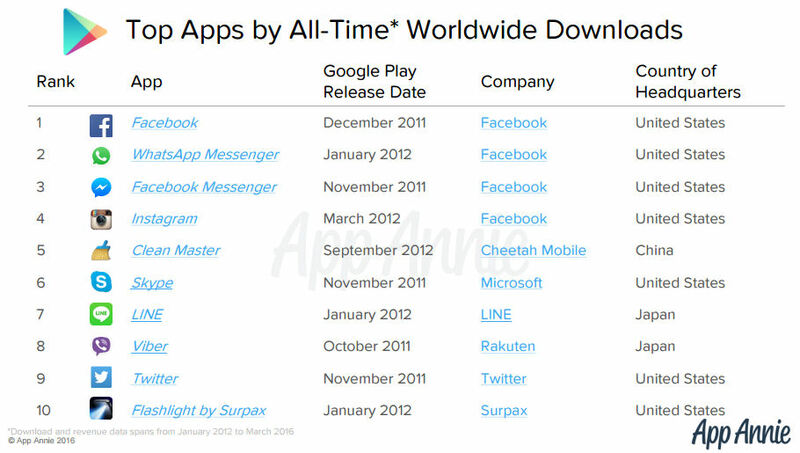 Coincidentally App Annie has released a report into the most popular Google Play apps of all time which, considering Android accounts for around 80% of the global market, provides a good snapshot into what the world uses its smartphones for. In terms tof total global downloads Facebook dominates, accounting for the top four, albeit with two of them coming from expensive acquisitions. Most of the rest of the top ten are communication or social apps, confirming that the main use for smartphones is keeping in touch with people via means other than voice calls. In terms of app revenue the smart money is in Japan, where they seem to spend far more on apps than any other country. 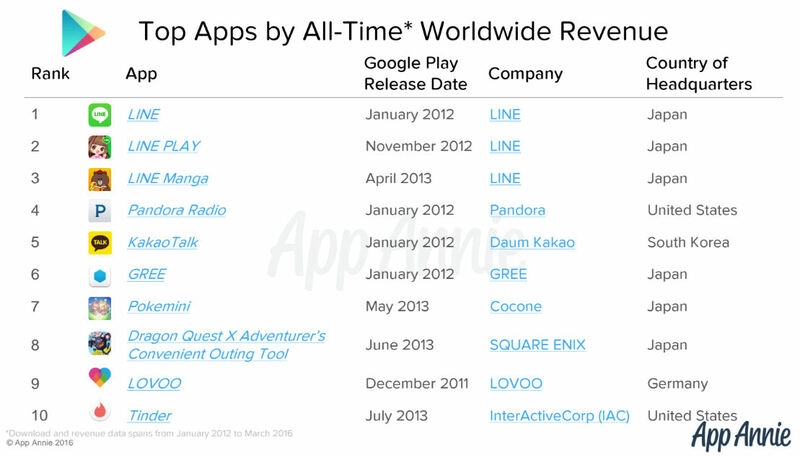 The top three revenue generating apps of all time are all variations of LINE, the Japanese social and messaging app. 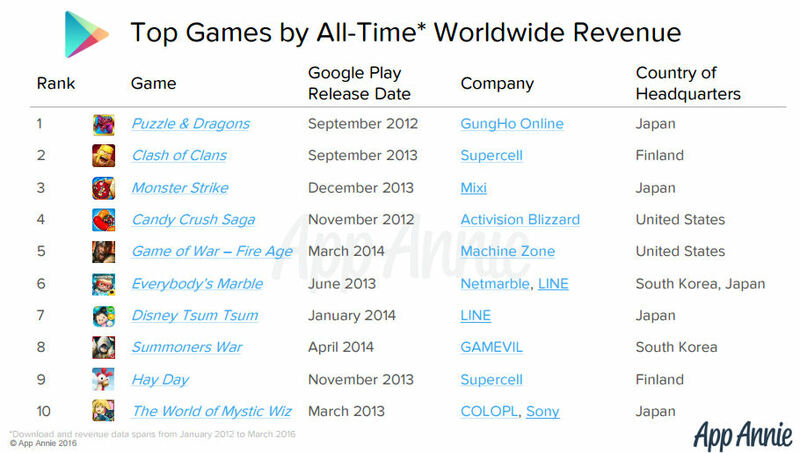 Furthermore when looking at just games four of the top ten are Japanese, indicating they are more willing to both pay for apps and make in-app purchases than the rest of the world.